Happy New Year! I hope you had a great holiday season with friends, family, and loved ones. I wish you good health, enjoyable work, and lots of joy in 2019. Hopefully a snowy winter will provide you ample opportunity to enjoy sledding with your families or some of our area’s fabulous outdoor recreation. As for me, the new year means that the legislative session is right around the corner. Like most years, the start of session brings a continuation of certain things but also some changes and additional responsibilities. The Senate Republicans are down a few positions following recent retirements and elections. The split in the 49-member Senate chamber for this year will be 28 Democrats and 21 Republicans, which has resulted in fewer committee assignments for Republicans. I was recently re-elected to my role of Deputy Floor Leader for the Senate Republicans and am honored that my colleagues have again selected me for this position. With the 105-day session upon us and the three state budgets (operating, transportation, and capital) to develop, we will certainly stay busy with legislation on the Senate floor. As a member of the elected leadership, I meet regularly throughout session with the Republican leadership team and discuss issues regularly with elected leaders from the Democratic Caucus. 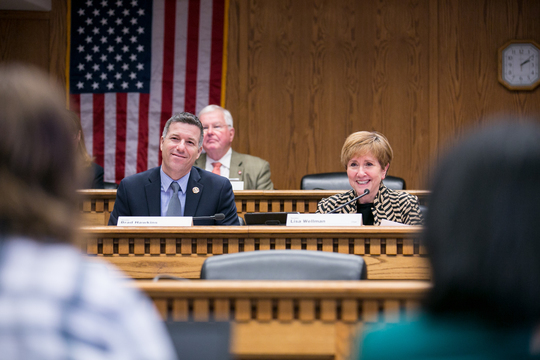 I will continue my service this year on the Senate’s Early Learning and K-12 Education Committee, which is chaired by Sen. Lisa Wellman (right) of Mercer Island. In my new role as the committee’s ranking member, I will work more closely with the chair and staff on committee legislative matters. This position will give me opportunity to put my 10 years of school board experience to good use on issues. The Legislature will also stay busy with its committee work this year. I will serve on two policy committees this session instead of three from last year. These include the Senate’s Early Learning and K-12 Education Committee and the State Government, Tribal Affairs and Elections Committee. In addition to my leadership role in the caucus, I have been selected as the ranking member of the education committee. This is the title assigned to the highest-ranking minority member of the committee and refers to the senator who works closely with the chair and staff on committee matters. Prior to my election as state representative, I served for 10 years on two different local school boards. This work included about two years of service on the North Central Educational Service District board in Wenatchee and eight years of service on the Eastmont School Board in East Wenatchee, including multiple terms as school board president. My hope is to put this school district background to good use during my continued service on the committee and now as its ranking member. Listening and being accessible to you are my top priorities, and I welcome your feedback on issues or concerns. Please contact my office anytime by phone, letter, or email. If you are planning a trip to Olympia, please let my office know so that I can try to connect with you when you’re here. If you or your group would rather save the trip and meet back home, I will be making myself available during scheduled times on Saturdays. Please contact my office at 360-786-7622 or by email at brad.hawkins@leg.wa.gov to schedule a Saturday appointment in the district.